Water is something we all need to survive. There are many interesting facts about water. For example, did you know that 97 percent of the water on Earth is in the oceans? How about that the water you drink today may have been the same water a dinosaur drank millions of years ago? Did you know that there is more fresh water stored up underground than in all the lakes, rivers, and streams on Earth? Make a guess of how much water your family uses each day. Then go to the Excel spreadsheet “Water Use” and calculate a more precise estimate. Was your original guess too low or too high? What did you find out about how much water your family uses? The total amount of water that is on Earth is constant and never changes. There is the same amount of water today that there was 10 million years ago. Water also changes form over time. We usually think of water as a liquid, but it can also exist as a gas (steam) or as a solid (ice). One drop of water may fall as rain, run off into a stream, and evaporate back into the air again thousands of times. In order for water to change form, energy is required. This energy comes from the Sun. 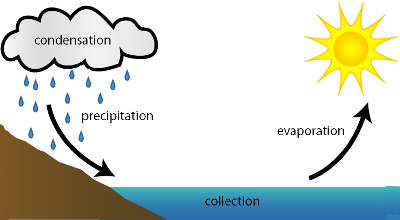 The water cycle is the process through which water moves above, on, and under the earth. It is called a cycle because it is like a circle that goes around and around over and over. It is a closed system, which means that nothing is gained or lost from the system. There is always the same amount of water present. The water cycle is also called the hydrologic cycle (“hydro” means water.) Clouds, rain, snow, rivers, lakes, and evaporation are all part of the water cycle. Important parts of the water cycle include precipitation, condensation, runoff and storage, evaporation, and transpiration. Precipitation is when water in some form falls to the Earth. 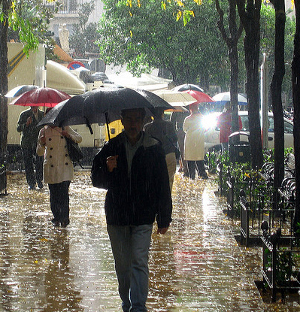 Rain, snow, sleet, and hail are all examples of precipitation. Rain is a kind of precipitation. A cloud is a collection of particles of water. In a cloud, water is in the form of vapor. Clouds like this contain water in the form of vapor. As the very small particles of water cool, they condense to form tiny drops of water. When the water accumulates and the conditions are right, the water falls to Earth. If it is above freezing, the result is rain. If it is below freezing, the result is snow. If it is colder in the clouds than on the ground, sleet or hail may fall. 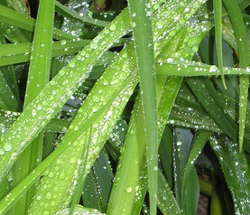 Have you ever come outside in the morning to find the ground wet with dew? This is because water from the air has come to Earth in the form of condensation. This is when water that is in a vapor form changes to a liquid form. If you hold a glass over a steamy cup of hot liquid, you will see water form on the glass. This is condensation. The vaporous water is condensing or changing to liquid on the cooler glass. When water falls to the Earth, it collects in pools and puddles. Some water goes into in lakes, rivers, or streams. Water forms small streams that feed into larger streams. These larger streams go into rivers. All of this water that we can see is called surface water. Eventually, much of this water flows to the ocean. This process is called runoff. As water flows downhill in streams and rivers, it carries dirt with it. Over thousands of years, the water can wear away rocks and carve canyons and valleys in the land. This process is called erosion. Much of the water on Earth is stored in the oceans. 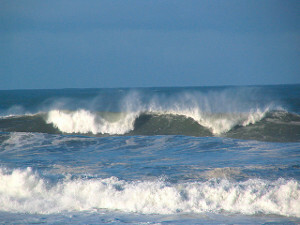 In fact, over 97 percent of all water on Earth is in the oceans. The water in the ocean is salty. Some water is stored as ice at the North and South Poles. Glaciers are huge pieces of ice that stay frozen all the time. Some water is captured by people and stored for a variety of uses. We use water to drink, to make food, to wash with, to water crops, and to give to animals. Water is essential to every living thing. There is also a lot of water under ground. This is called groundwater. Most groundwater is stored in the cracks and spaces between the rocks and the soil. The water table is the top part of the ground that is saturated with water. When people dig wells to get water, they are tapping into the groundwater. 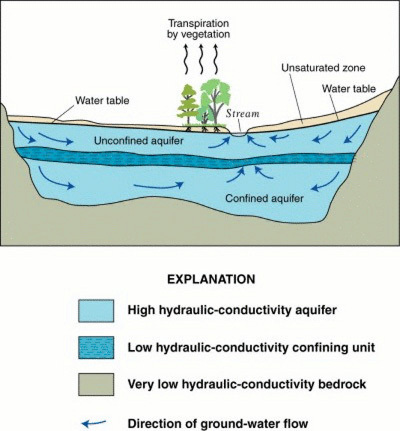 An aquifer is a layer of rock that contains a large amount of groundwater. When water is stored in oceans, lakes, or other reservoirs, some of it evaporates. This means that it turns back into a vapor and goes into the air. If you have ever left a pan of water outside and come back to find the water gone, it may have evaporated. The Sun is the main source of energy that causes evaporation on Earth. The hotter the Sun is the faster evaporation happens. Sometimes, in the summer, after a big rain shower, the Sun comes out and dries everything up quickly. The more heat of the Sun that gets to the Earth, the more water evaporates. Air blowing over a wet surface also makes evaporation happen faster. Water evaporates from the oceans every day. It forms clouds in the atmosphere and eventually falls back to the Earth as rain. Some water also evaporates back into the air from plants. This is called transpiration. In transpiration, water passes from plants to the air through the cell walls of leaves and also through small openings called stomata. For each of these parts of the water cycle, there are transfers of energy. Energy from the Sun is required for evaporation to occur. When condensation occurs, this energy is returned and the air is warmed. Heat energy is used or produced to change the form of water from water to vapor or vice versa. Energy is also produced as water moves downhill as groundwater. People harness this energy by building dams to generate electricity. 1. Which of these is not a part of the water cycle? 2. What is it called when water evaporates into the air from plants? 3. There is the same amount of water today as there was a million years ago. 4. Where is most of the water on Earth? 5. 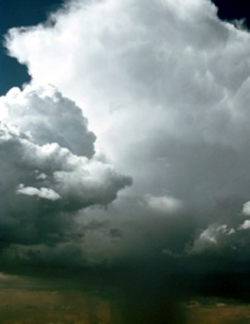 Where does the energy that drives the water cycle come from? As water moves over the surface of the land, it goes downhill. Small streams flow downhill into bigger streams and then into rivers. The rivers flow downhill into bigger rivers and eventually into the ocean. 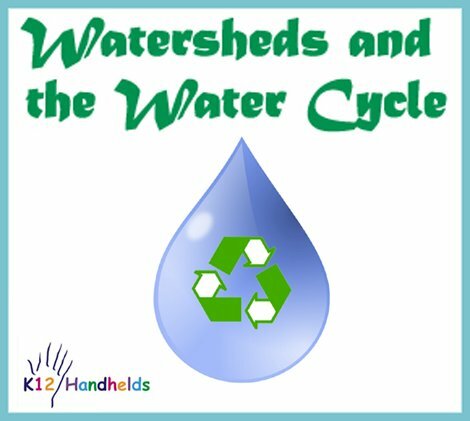 A watershed is an area of land that all drains into one body of water. In the United States, the Continental Divide is a line formed by a high ridge of mountains, mostly in the Rocky Mountains. All the streams and rivers to the west of the Continental Divide eventually flow into the Pacific Ocean. All the streams and rivers to the east flow into the Atlantic Ocean. 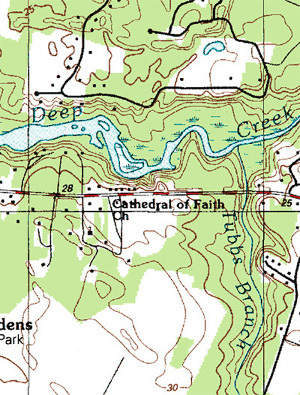 The size and area of a watershed is determined by the topography or surface features of the land. Because water flows downhill, areas of higher elevation such as mountains divide watersheds. Contour maps, also called topographic or topo maps, show the elevation of land. On a contour map, contour lines are used to show all the points that are the same elevation. For example, one line may be drawn to show all the points that are 1,000 feet above sea level. Another line may show all the points that are 1,200 feet above sea level. When looking at contour maps, some general rules can be followed. Lines that are closer together show greater changes in elevation or steeper areas. Lines that are farther apart show more gradual elevation changes. Circles often indicate hills or mountains. The innermost circle with the highest elevation is the top of the hill or mountain. “V” shaped patterns indicate valleys. In the United States, there are many watersheds. 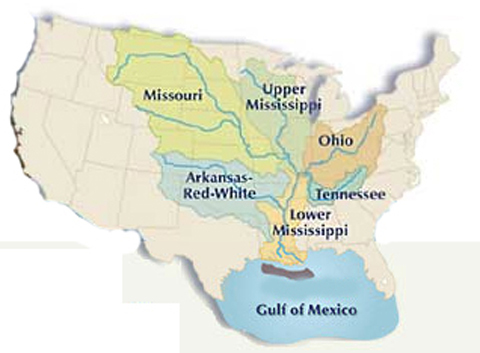 For example, the Mississippi River watershed is a very large area that all drains into the Gulf of Mexico. The Mississippi River watershed includes land from Minnesota and Wisconsin to Louisiana and Mississippi. The Chesapeake Watershed includes six states and the District of Columbia. This area all drains into the Chesapeake Bay in the Atlantic Ocean. The Chesapeake Bay is the largest estuary in the United States. It is the home to many species of fish, plants, and waterfowl. Many people visit the bay to enjoy water activities, and many businesses rely on the two major ports there. Over many years of development, the Chesapeake Bay suffered from increasing pollution and runoff. In the 1970s, a major environmental crisis was recognized. Large algae blooms and a steep reduction in oxygen levels resulted from waste runoff from farms and industry throughout the watershed. Fish and waterfowl died as a result. Oysters, which help filter the water, also died, making conditions even worse. Recognizing the crisis, a group of states in cooperation with the federal government and other partners formed the Chesapeake Bay Program. They made an agreement to work together to meet a number of goals, including to reduce the amount of nutrients reaching the Bay by 40% and to increase the number of the Bay’s plants and animals. The program has resulted in a number of improvements. Waste from runoff has been decreased. Submerged aquatic vegetation (underwater plants) has increased significantly. Many fish populations are increasing. There is much work still to be done, but through efforts like this, the condition of watersheds is improving. 6. What is an area that drains into one body of water called? 7. What kind of maps show the elevation of the land? 8. Which of these is not a problem the Chesapeake Bay had? As water goes through the water cycle, it may pick up chemicals. Some of these come from natural sources. For example, water may pick up salts or boron from the surface of the earth. In small quantities, these elements are not harmful, but in larger quantities, they can be dangerous. Water may also pick up chemicals or other dangerous compounds that come from pollution or other human activities. In order to make sure our drinking water is safe, local governments in the United States store, treat, and transport water. They have elaborate systems to do this. The process begins with taking water from surface water and groundwater. This water can be stored in large reservoirs. It is then piped to water treatment plants. Some water is treated to be drinking water, while some is treated for industrial use or to be put back into the natural environment. Water treatment methods vary. First, water is run through a filter to remove large objects like twigs or small rocks. Water can also be filtered through sand or carbon to remove smaller items. Then chemicals, such as chlorine, may be added to the water to kill bacteria, as well as algae or other organic materials. Water can also be aerated, or mixed with air, to help give it a better smell or taste. After the water is treated and meets the standards of safe drinking water, it is stored in large tanks and transported to homes through a system of pipes. After water is used by humans, it becomes wastewater. The water that goes down the drain is wastewater. In rural areas, wastewater may go into a septic tank. This is a tank under the ground that allows solids to settle to the bottom and be broken down by bacteria. 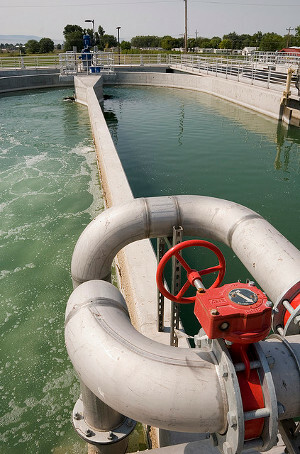 The remaining sludge is pumped out periodically, while the liquid part of the wastewater is filtered and returned to the groundwater. In bigger towns and cities, wastewater is piped to water treatment facilities. There, it is treated until it is safe to be returned to the environment. The water treatment methods that have been described here are used in many developed parts of the world, such as the United States. However, in less developed parts of the world, water treatment systems do not exist. In those areas, water must be transported from rivers or lakes by hand to homes and businesses. People must then treat it themselves to be safe for drinking. In some parts of the world, people often die from diseases spread by unsafe drinking water. In addition, some areas do not have wastewater treatment systems, creating further dangers for the water supply. As the number of people in the world has continued to grow, human activity has affected the water supply in many ways. It was once thought that there would always be enough water for everyone. However, there are now areas that face water shortages. Some areas have taken water out of the lakes and groundwater faster than it is replenished. Other areas have polluted their water supplies so much that the water is no longer usable. Over time, the population has grown. Cities have grown larger, and more factories have been built as technology has advanced. New farming methods have been developed to grow more food. While all of this development has a positive side, it also has a negative side. Water pollution is one of those negatives. Some pollution comes from factories that pump chemicals into the air and the water. Another source of pollution is chemical fertilizers and pesticides that farms use. These chemicals run off into the groundwater. One very large source of pollution is the petrochemical industry. Petrochemical factories produce things with chemicals found in natural gas and oil. Many of these compounds are very useful in producing industrial goods. However, the waste products of this type of production can lead to pollution, especially when they are buried underground or dumped into water supplies. Water can be contaminated when it falls as precipitation through polluted air. Water can also be contaminated when runoff comes into contact with chemicals on the ground. For example, when rain hit roads and runs off, it can pick up oil and other chemicals that are used on the roads or that come from cars. Pollution also seeps into the ground and affects groundwater. The Environmental Protection Agency (EPA) is a part of the United States government that was established to protect the environment. One of its jobs is to make sure we have clean drinking water. The Clean Water Act is a law to do this. The Clean Water Act regulates how much pollutants can be discharged into water in the United States. It gives the EPA the power to put into place pollution control programs. It also sets water quality standards for surface water. The Clean Water Act has had a big effect on regulating water quality. In one case in 2004, the EPA settled with Wal-Mart for storm water runoff violations at various construction sites in several states including Delaware, Utah, and Tennessee. Wal-Mart had to stop the violations, pay $3.1 million, and help pay for environmental programs to protect wetlands. The Delaware River watershed has also been cleaned up as a result of the Clean Water Act. Another problem that faces our water supply is the wasting of water. In the United States, we use many times more gallons of water per person than in other parts of the world. In some parts of the country, water is being pumped out of aquifers faster than it is replenished. While there is always the same amount of water on Earth, using water wastefully means that there may not be as much clean water as we need. The cost of cleaning and transporting water may grow very high as well. As one example, the western part of the United States, including California, gets most of its water from a very large aquifer called the Ogallala Aquifer, which is in the Great Plains. Currently, water is being taken out of this aquifer at a rate that is much faster than the natural rate at which water comes back into the aquifer. If this continues, eventually the aquifer may run dry. There are many ways that water can be conserved, so that water shortages are not as a much of a risk. In homes, leaky faucets and toilets account for a large waste of fresh water. Reducing lawn watering and planting plants that need less water helps conserve water. Just being conscious of not wasting water can help save millions of gallons a year. Helping to conserve the environment in other ways also helps keep our water supply clean. Reducing litter, reusing plastic containers, and recycling newspapers all helps the environment. Much of the water that is used in the United States is for agriculture. There are many things that farmers can do to conserve water. One is to use more efficient irrigation methods. Farmers can also use fertilizers and pesticides that don’t pollute the water supply. Organic farming, which doesn’t use synthetic chemicals, has become popular as a way to protect the environment. There is an abundance of water on Earth, but it is up to us to take care of that water and our environment to make sure we all have plenty of clean water in the future. 9. Water that is taken from aquifers must be treated before it is safe to drink. 10. Which of these is not used as a water treatment method? 11. Every country’s government treats their water before it is distributed. 12. What government agency is responsible for protecting the environment, including our water? 13. What piece of legislation has been important in cleaning up U.S. water supplies? 14. Wasting water is a problem in our country. 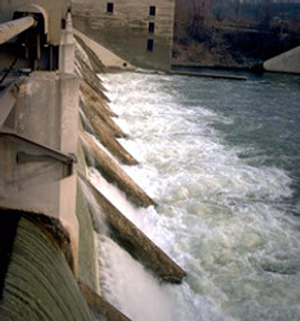 This dam uses the power of water to create electrical power. Franklin Watts. New York, 1985. Facts on File: New York, 1992.